Boxing trainer Naazim Richardson, who has guided future Hall of Fame fighters Bernard Hopkins and Shane Mosley to world championship victories, will earn a well-deserved honor of his own when he is officially inducted into the Pennsylvania Boxing Hall of Fame on May 18. Richardson is part of a 10-member class of 2014, which includes fellow trainer Mitch Allen; boxers Jacqui Frazier-Lyde, Earl Hargrove, Percy Manning, Mike Picciotti, Earl “Gunboat” Smith and Jimmy Tygh; cut man Leon Tabbs; longtime Philadelphia Daily News boxing writer Stan Hochman. Frazier-Lyde is the daughter of former heavyweight champ Joe Frazier. Hopkins is the fighter most closely associated with Richardson. The men share similar backgrounds: Both are from Philadelphia, both spent time in prison as youngsters, and both have since converted to Islam. Richardson has been in Hopkins’ corner for the 49-year-old’s record-setting run as the oldest boxer to win and successfully defend a world title. 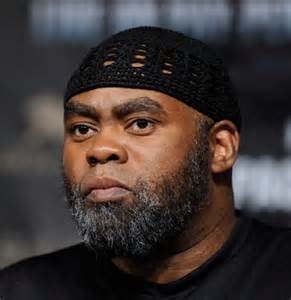 Richardson is recognizable to many fight fans due to his ever-present kufi (a knit cap worn by Muslim men from various countries and cultures) that he wears in the ring and his colorful (if sometimes profane) language in the corner. He also trains former cruiserweight champion and current heavyweight contender Steve Cunningham as well as a handful of other fighters, including super heavyweight kickboxer Badr Hari. Is pro basketball ready for Bilqis Abdul-Qaadir?